Superfund is a federal law of the United States created to clean the deserted hazardous waste areas or sites. This program was designed by Comprehensive Environmental Response, Compensation, and Liability Act (CERCLA) in 1980 with the purpose of cleaning hazardous substances that may pose threat to both public health and the environment. Also, the law entitles the Environmental Protection Agency (EPA) to analyze and order the parties to clean the threatened areas or clean the site itself in absence of the responsible party. Congress executed the Superfund act for the first time during the disaster at the Love Canal in New York, in which the Love Canal residents suffered severely with chronic effects such as leukemia and birth defects. This was because the city was made on hazardous industrial and chemical dumping site and episodes of heavy rains leached all the chemicals from the soil into the community. 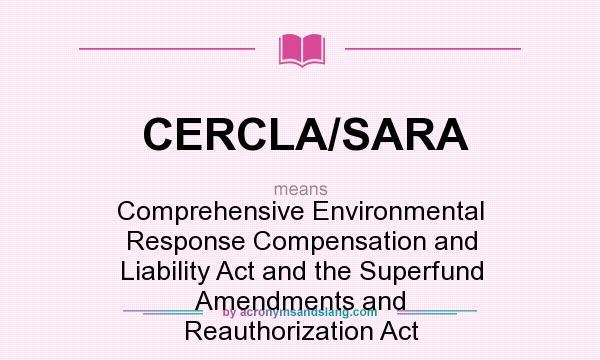 On 17 October, 1986, Superfund Amendments and Reauthorization Act (SARA) was formed, that amended CERCLA and increased the spectrum of Superfund Act. These broad changes also helped increase the fund to $9.3 billion. Removal: These types of actions typically target localized releases that need immediate attention. Removal actions can be either emergency, time- critical and non-time critical. Remedy: These types of actions target those releases that may take longer to clean than removal actions. However, the remedial actions are permanent and minimize the risks involved. These actions can only be performed at the listed sites (National Priorities List) on the EPA. After the potentially hazardous site is identified, an initial assessment is conducted under EPA. The inspection contains all the information of the site including reviews, visual inspections, field sampling and interviews. Further, a Hazard Ranking System (HRS) is developed to analyze the CERCLA statues of the field. An intensive assessment of the field (Remedial Investigation/Feasibility study (RI/FS)) is done if the HRS is high to determine the extent of contamination and threats. A consent plan is then made and presented for approval by public. Upon selection of the plan, remedial action is performed. There are approximately 1,270 hazardous sites listed on the National Priority List as-of-date. Also, over a span of 5 years, funding of $1.6 billion is generated and the tax goes to the tax fund. This tax fund is utilized in cleaning up of the threatened waste areas. In 1986, an attempt to reform the Superfund legislation led to the formation of the Superfund Amendments and Reauthorization Act (SARA). SARA helped to increase funding that was utilized for further studies and development of new technologies. An attempt to further improve the Superfund act was proposed by Clinton administration in 1994. However, it could not be implemented by severe opposition by the Republic.